York and I really think this is one of the best restaurant we have tried so far together in Australia. This may not be a fancy restaurant, but it is neat and simple and the food is spectacular. The food is true to its flavors without extra addition of sauces. One day I while I was listening to the radio, a couple said they have been trying to save up for a romantic night out at Star of Greece, I got curious and started looking up on the restaurant. 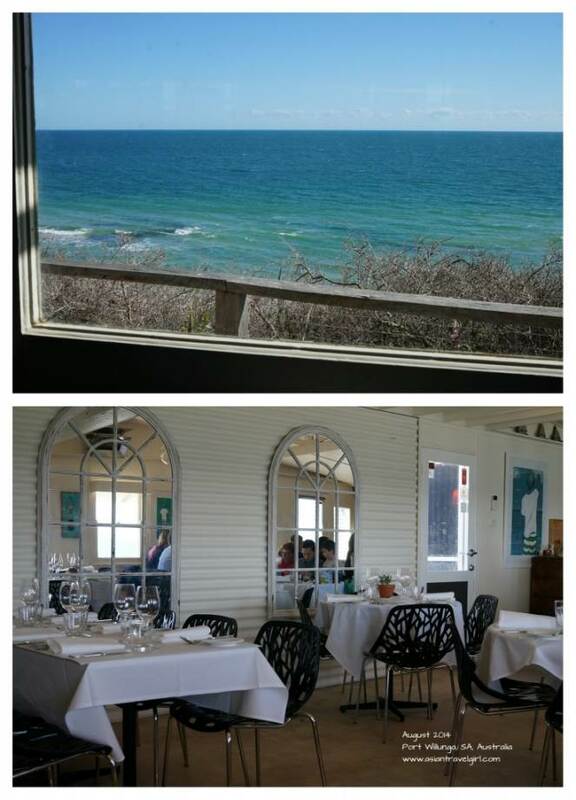 Star of Greece is located at Port Willunga, approximately 1.5 hour drive, which makes a perfect dinner or lunch place if you are on the way to McLaren Vale. We were very lucky to get a booking for Sunday lunch as there was a cancellation, usually people will need to book weeks in advance since they don’t open everyday. 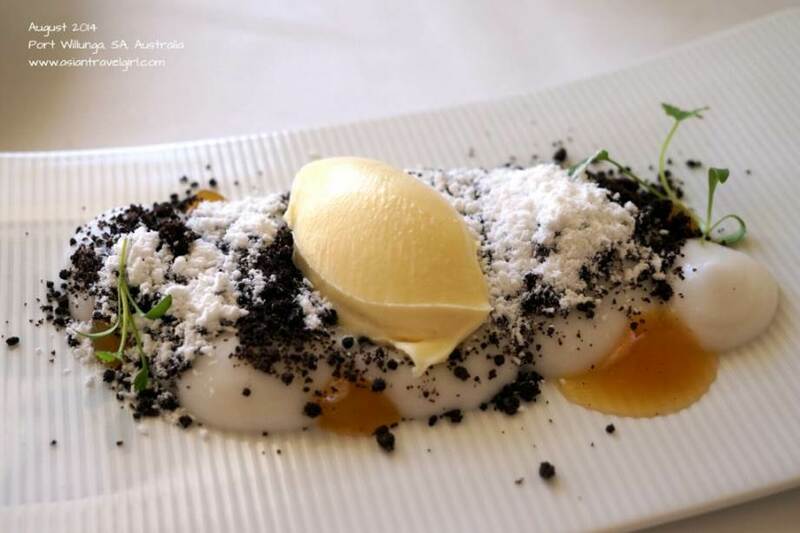 The other restaurant we wanted to try was d’Arrys Verandah Restaurant @ McLaren Vale, which we had no luck until 2 weeks later since it is one of the best restaurant in McLaren Vale. By booking 2 weeks in advance and we still only got the 2.30pm session for a Sunday lunch. The name of the ship sank in 1888. 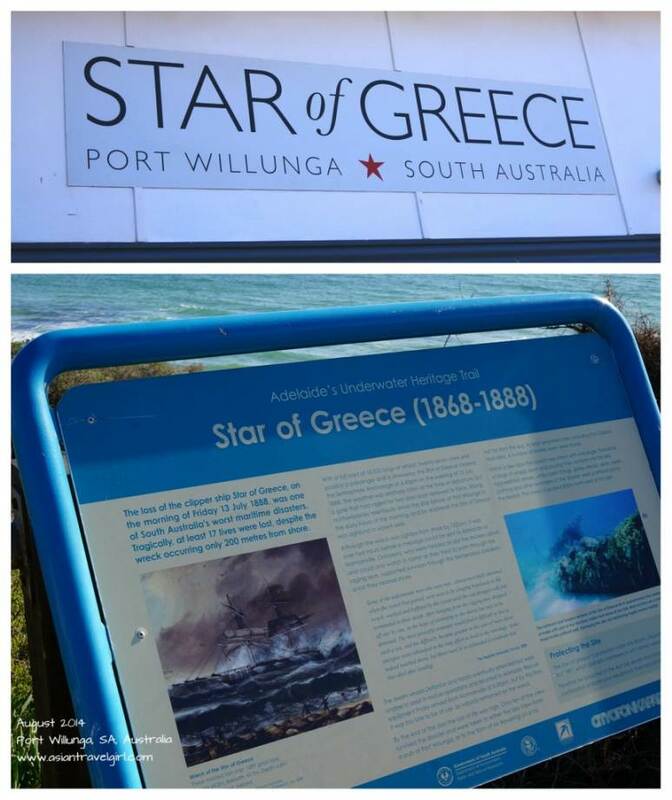 The name Star of Greece comes from the fact the restaurant is situated at a cliff looking over turquoise water where a ship named “Star of Greece” sank in a storm while it was on its way to Britain, killed 17 men in total. According to the restaurant, the remnants of the ships can still be seen from the shore during low tide. However we weren’t there at the right time to witness that. 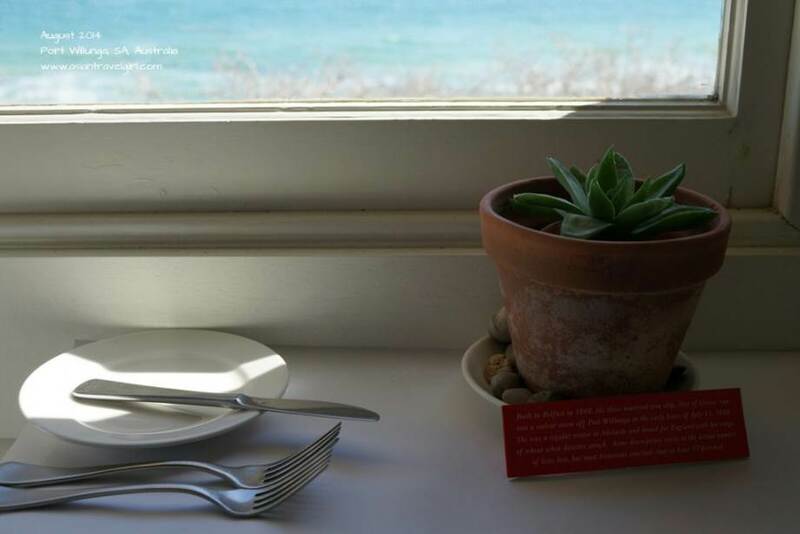 York booked us a corner table next to the window, it was beautiful looking at the blue sea on a lovely Sunday noon. The restaurant itself was quite small, they also hosted a small function in the main area with a lot of kids. The noise level was still acceptable from where we were seating. 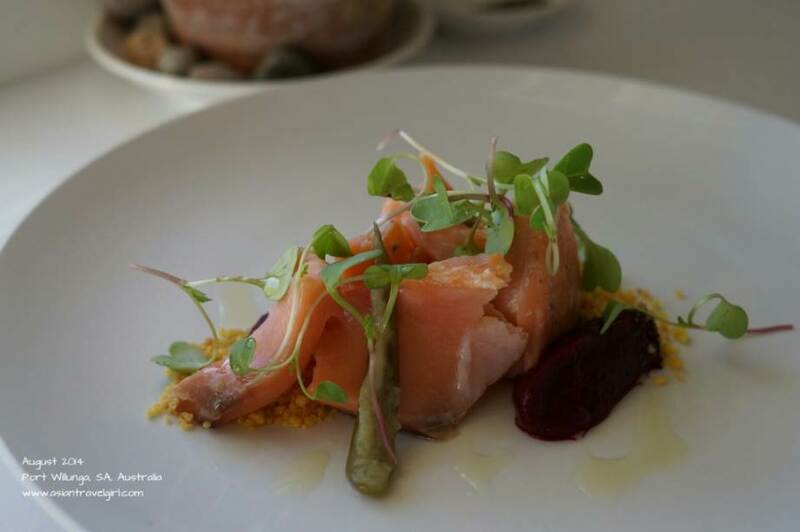 The restaurant pride itself with the wide range of fresh offerings from the sea and local produce they provide. Needless to the say there’s a menu for every season, we had the pleasure of trying the winter menu. 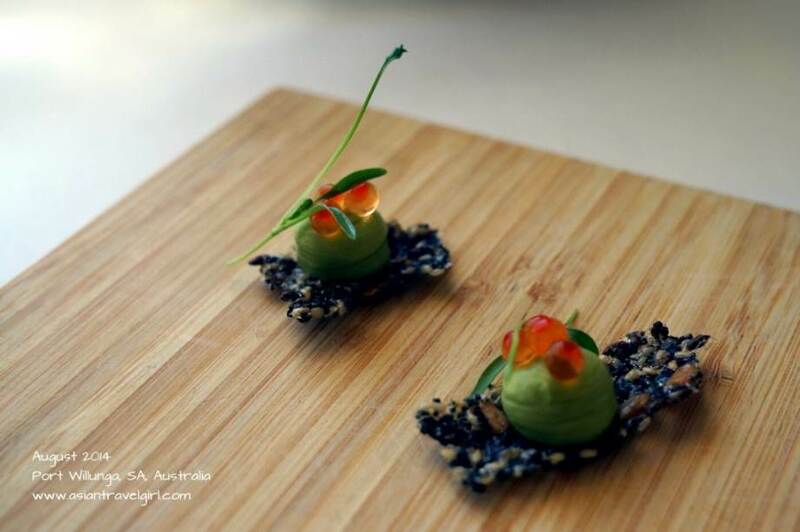 Although they do offer a 9 course winter tasting menu for AUD$70 per person or AUD$80 per person on Sunday or public holiday, York and I decided to order separately since out of the 9 courses 1 was hand-made bread, the other one were oysters and one was petit fours after the desserts. There were only 2 choices for mains as well. 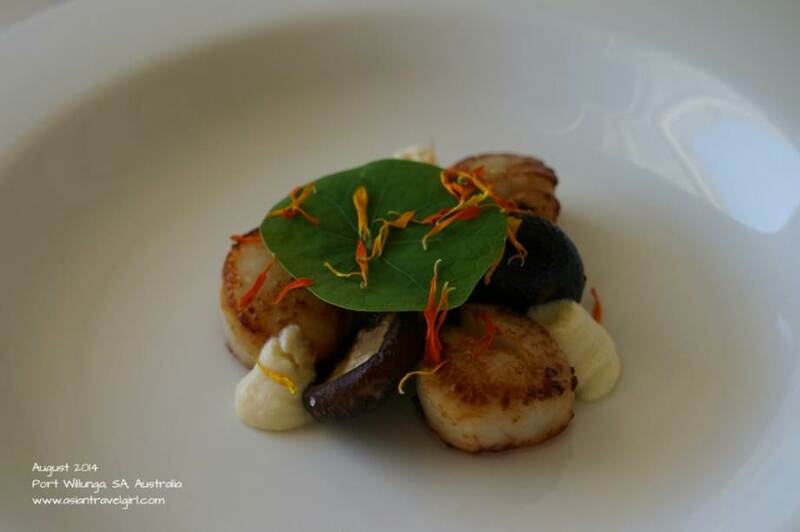 We started our entree with “Seared deep sea scallops, shiitake mushrooms, macadamia cream (AUD$18)” and “Hot smoked Atlantic salmon, spiced beetroot, pickled cucumber, corn bread (AUD$18)”. The dishes looked very cute, the leaf on the scallops and shiitake mushrooms reminded me of the Japanese animation “My Neighbor Totoro” produced by Studio Ghibli. The scallops and salmon both were very fresh and each ingredient blended very well. 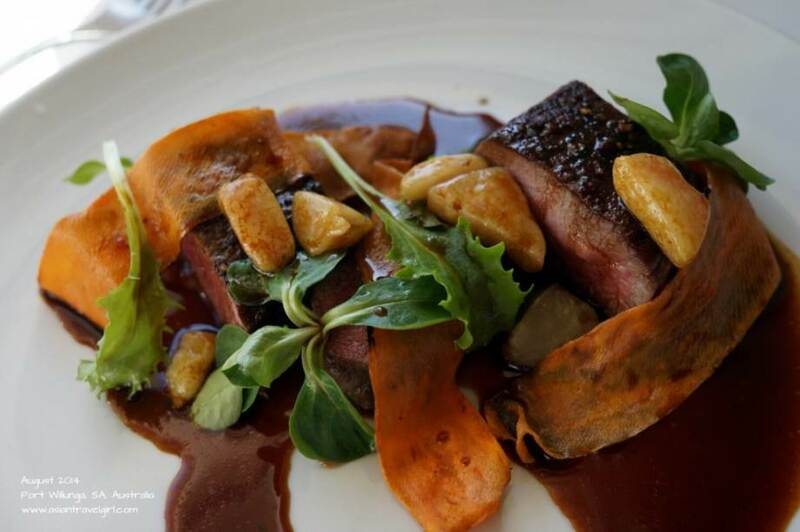 For mains we ordered today’s special “Lamb back strap with salads (it wasn’t written down, so couldn’t remember the price and the exact name)” and “Local seafood bouillabaisse, wild fennel, garlic crouton, rouille (AUD$38)”. 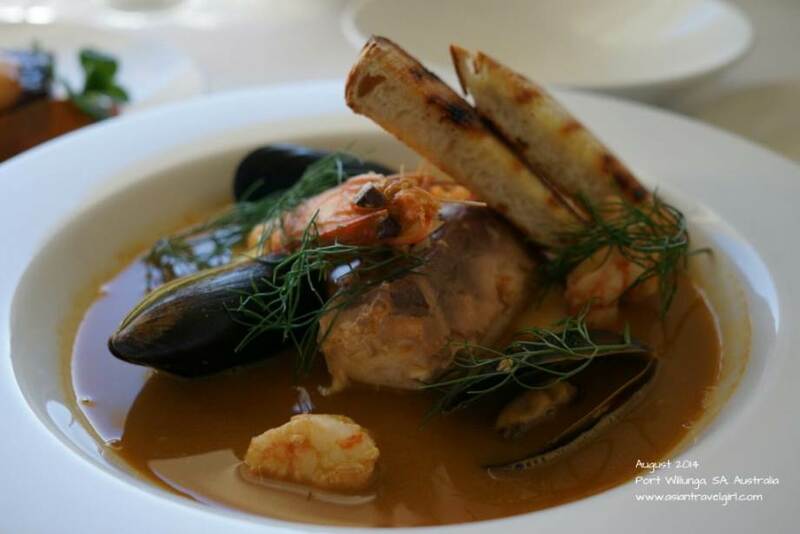 The selection of local seafood changes accordingly, we had mussels, tiger prawns and some sort of fish inside the bouillabaisse. Both mains were delicious and cooked to perfection. It was very similar to The French Cafe (Auckland, New Zealand) where the ingredients were so fresh, the chef does not need extra sauces or seasonings for the food to taste better. These 2 mains were surprisingly refreshing since lamb and bouillabaisse in other places are usually quite heavy. This is the first time in Australia I actually thought the mains were comparable to the entrees (since a lot of places entrees are quite good and mains are a bit boring). 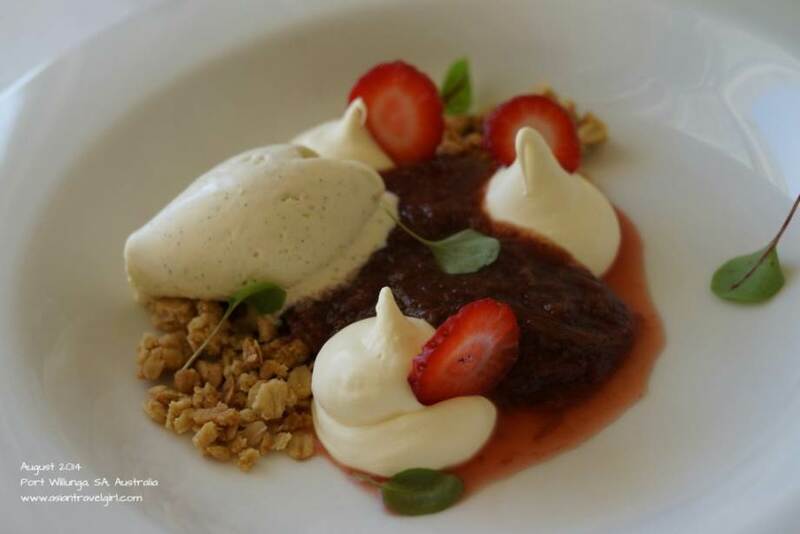 We finished our lunch with 2 lovely desserts “Strawberries and rhubarb, oat crumble, vanilla bean ice cream (AUD$16.50)” and “Coconut mousse, white chocolate, pineapple, cocoa (AUD $16.50)”. I was absolutely in love with the oat crumble and vanilla bean ice cream. After helping my mom sourcing natural ingredient ice creams in New Zealand for export, I can now tell the difference between high quality ice cream and medium quality ice cream (but could be selling at a high price due to marketing). These vanilla ice creams were pretty good, doesn’t taste like artificial sugar overload. The coconut mousse was very well made, York really enjoyed it. I am not a great fan of coconut, so I couldn’t comment much. 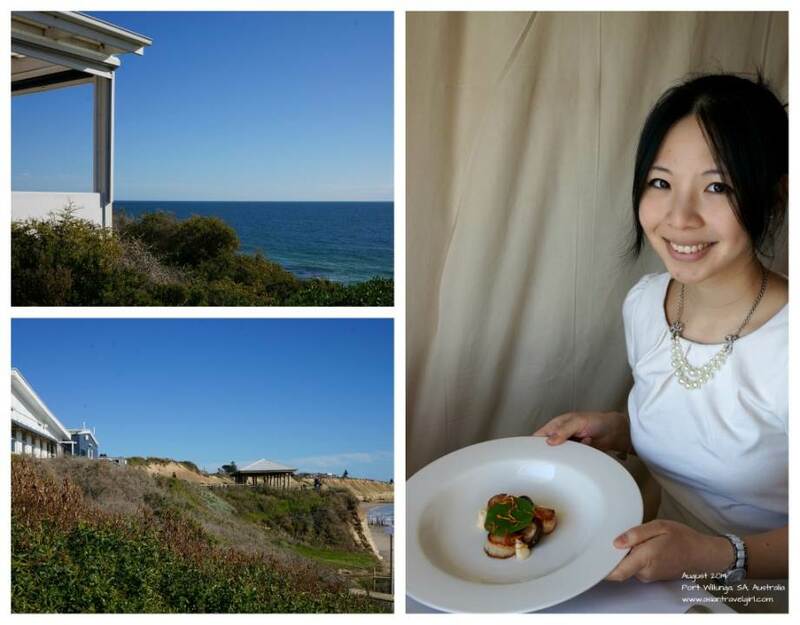 One of the best food and views in South Australia. 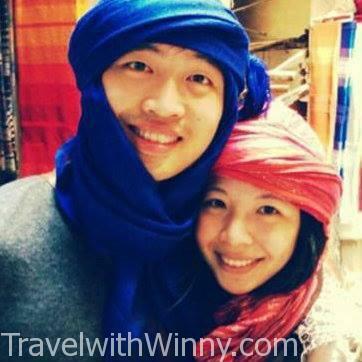 York and I really think this is one of the best restaurant we have tried so far together in Australia. This may not be a fancy restaurant, but it is neat and simple and the food is spectacular. Especially for someone like me who dislike sauces in my food (yes, I eat my sashimi without soy sauce or wasabi, I like the natural taste of fish), this place really satisfied my taste buds 🙂 Even though the drive was long, we will definitely come again!